WITHOUT parental consent you must be 18 years of age or older. WITH parental consent you must be 15 years of age or older. If you’re underage, both you and one of your parents need to provide a valid state or federal-issued photo ID with matching last name AND address (school ID’s are not acceptable). If for some reason either of those things don’t match we need a state/federal issued form explaining the difference (ex: birth certificate, marriage certificate, divorce decree) Please note, any of those forms do NOT replace the need for either of the ID’s. Acceptable forms of ID include a valid state ID card, a drivers license, a drivers permit (hard copy) a passport or military ID. Celebrating your birthday should be sweet, swing in ON your special day and we’ll give you $10 off your piercing. Even sweeter yet, if you get pierced with any of 14 karat gold we’ll pierce you for free! We understand that when you’re looking to get pierced it’s nice to have an idea of what you’ll be spending. We’ve provided the list below to help you out! PLEASE NOTE: These prices DO NOT include the cost of jewelry. With our ever-changing jewelry selection and more than one location it would be almost impossible for us to price jewelry here. We do however welcome you to come in anytime and browse over options and price pieces out. Also, you may notice that some piercings list specific piercers able to perform them. If you’re looking to get one of those piercings please check our piercer’s schedules on each of their pages or call ahead to the shop you’ll be visiting. Is your child under 15 and asking to have their ears pierced? Once you’ve both decided you believe the time is right take a look at our guidelines below. If you believe the guidelines can be met then give the location you’d like to visit a call! We will schedule you a consult with a piercer and if our piercer deems it successful they will set an appointment for the piercing for before or after shop hours. What is the difference between externally threaded jewelry and the internally threaded jewelry that’s used at Wingnut Tattoo? Here is a fine example of the quality of the internally threaded jewelry we carry compared to lower quality externally threaded pieces out there. 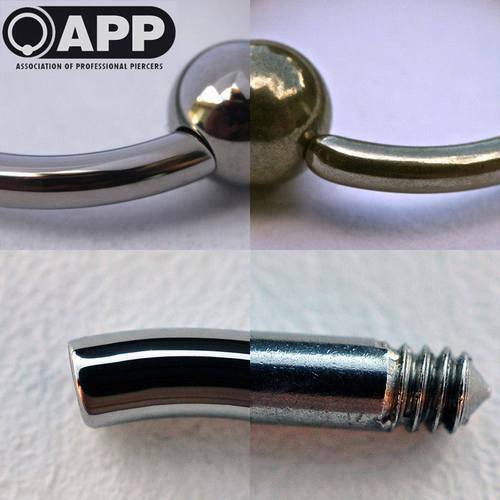 We pride ourselves on carrying ONLY internally threaded (left side of the photo), as you can clearly see using this provides our clients with far more comfort when their jewelry is inserted, along with a high polished mirror finish on every single piece we carry. We care about our clients and their health so we make sure to take every step necessary to only carry the best. My ears seem to be really sensitive to the jewelry I’ve worn in the past, can I wear jewelry from Wingnut Tattoo?